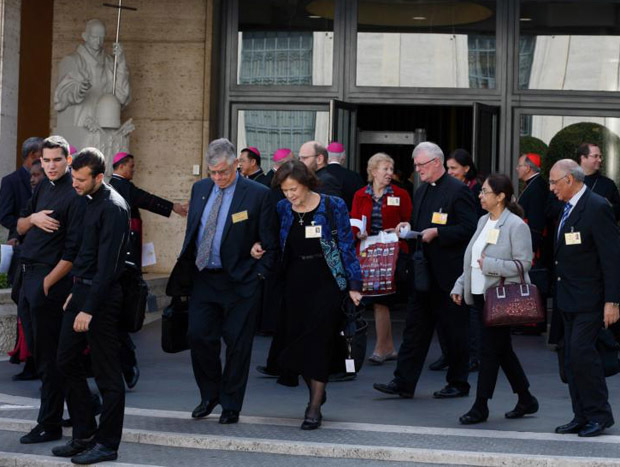 VATICAN CITY (CNS) — Couples attending the Synod of Bishops called for empathy and support from the church to families suffering difficult circumstances. Several lay couples and a missionary sister addressed the synod Oct. 15-16, highlighting various issues facing families in their countries and abroad. Anthony Witczak also called for a priestly formation that is geared to living a closer relationship with families in their parishes. The president of Parents Centres New Zealand, Sharron Cole, said that while the church’s teaching on conjugal love and responsible parenthood in “Humanae Vitae” has “great beauty and depth,” couples who struggle with either low-income, mental health problems or other difficulties find it hard to abide by those tenets. “As an ex-board member of Natural Family Planning, I know that this method of contraception permitted by ‘Humanae Vitae’ is an effective method for motivated couples,” she said. Moira McQueen, director of the Canadian Catholic Bioethics Institute, noted that elderly people are seldom mentioned in the synod’s working document. “This perhaps reflects what the elderly report: They are not seen as important; society tends to ignore them; they do not seem to matter,” she said. McQueen said that while the elderly not only deserve proper medical care, they also deserve spiritual programs that help them in the final states of life. “Pope John Paul II urged people to ‘live life to its end,’ and we can help elderly people do that by looking after their physical and spiritual welfare, protecting them from hastened death, and giving them reason to maintain their sense of purpose in life as long as possible,” she said. Dr. Anca-Maria Cernea, a Romanian and president of the Catholic Doctors Association of Bucharest, warned of a “cultural Marxism” that imposes gay rights, gender ideology and attempts to redefine family, sexual identity and human nature. “This ideology calls itself progressive. But it is nothing else than the ancient serpent’s offer, for man to take control, to replace God, to arrange salvation here, in this world,” she said. The church, she added, is called to protect the faithful from these dangers through evangelization and conversion. Sister Carmen Sammut, a member of the Missionary Sisters of Our Lady of Africa and president of the International Union of Superiors General, urged the Synod of Bishops to allow for more collaboration between the laity and the hierarchy. “If the image of church is the people of God, then we, the laity, would be expected to bring our knowledge to the discernment processes of the church, in view of decision-making, always in union with the pope and our bishops,” she said. She suggested that couples, as well as religious, can help in the formation of priests and ordained ministers. “I really dream of a church where each one is called to give his or her part for the construction of the whole,” she said.